A stunning mid 19th century English Ottoman, having a lift up lid with a lined ticking interior. All newly upholstered in a neutral linen with antique brass stud work decoration to all 4 sides, the whole raised on a moulded Mahogany rail with squat bun feet. 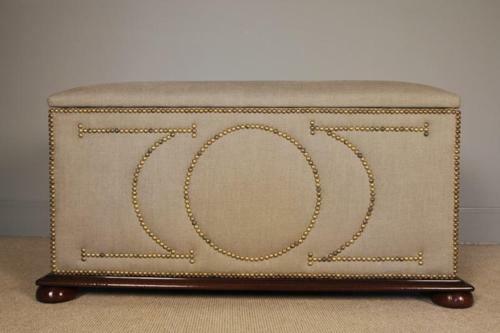 A superb looking ottoman in excellent condition throughout. CIRCA 1870.